"Dolly Parton's Christmas of Many Colors: Circle of Love"
“Dolly Parton’s Christmas of Many Colors: Circle of Love” is the 2016 holiday sequel continuing the heartwarming story of Dolly’s young life featuring the original cast. Update (Nov. 3, 2016): Dollywood will host the Hollywood Premiere of “Dolly Parton’s Christmas of Many Colors: Circle of Love” on Nov. 22, 2016. 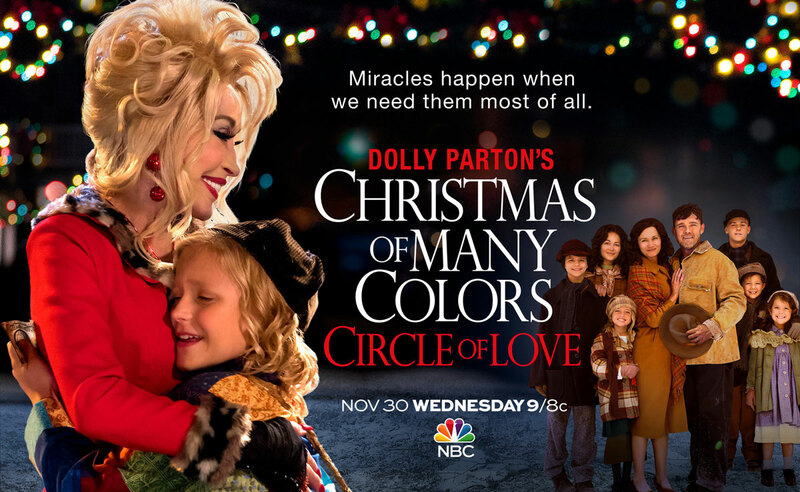 “Dolly Parton’s Christmas of Many Colors: Circle of Love” airs on NBC on Nov. 30 at 9/8c. “Dolly Parton’s Christmas of Many Colors: Circle of Love” is the next chapter in the life of young Dolly Parton. The film delivers Christmas joy and peril as an unexpected blizzard threatens the Parton family while at the same time Dolly’s father (and his kids) make sacrifices to raise enough money to finally buy his loving wife the wedding ring he could never afford to give her. Meanwhile, an important person in little Dolly’s life begins to see that her amazing voice and musical gift might just be made for something bigger than rural Tennessee. “Dolly Parton’s Christmas of Many Colors: Circle of Love” is written by Pamela K. Long. She executive produces with Sam Haskell and Dolly Parton. The film is a production of Magnolia Hill Entertainment and Dixie Pixie Productions in association with Warner Bros. Television. “Dolly Parton’s Coat Of Many Colors” premiered on NBC on Dec. 10, 2015, and drew a record-breaking audience of nearly 16 million viewers making it the most-watched movie on broadcast television in six years. It became available on DVD on May 3, 2016. Team Dolly is a collaboration of writers, editors, and publishers assembled by Dolly Parton Productions. Each member is dedicated to accurately publishing the latest news and historical archives of the living legend that is Dolly Rebecca Parton.